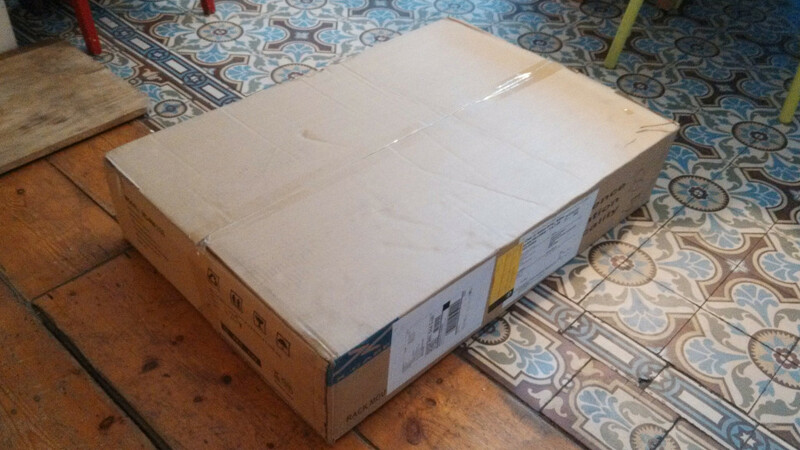 Oh hello box. I'm just takinga walk with my trusty box cutter. Why yes it is actually, in fact, a Robert Herder potato peeler. Let's pretend that never happened. 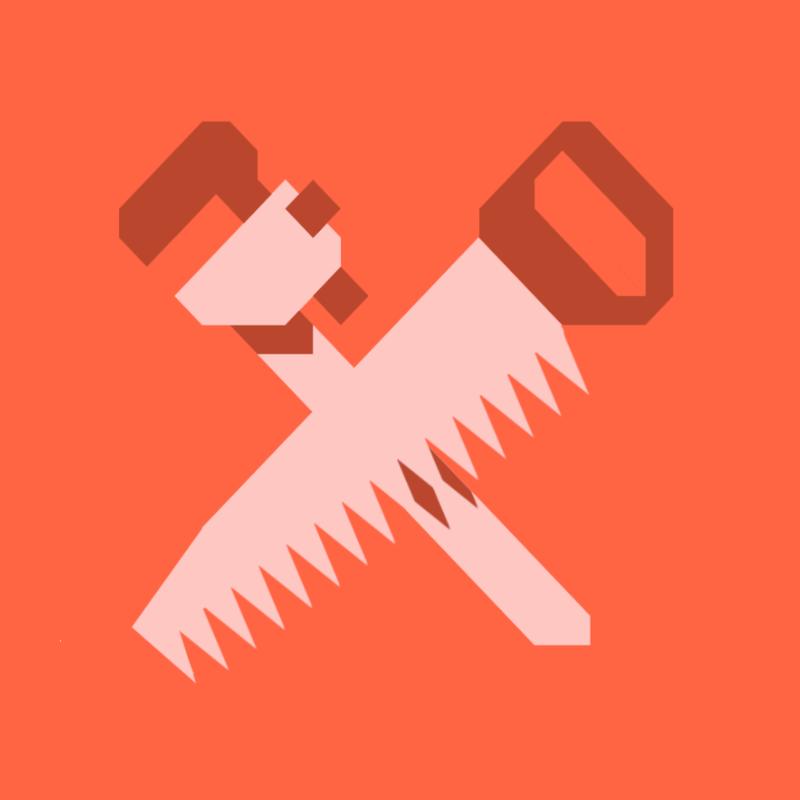 Look, rails. They came for free. Case, rails and shipping were 190 euro from X-case in the UK. 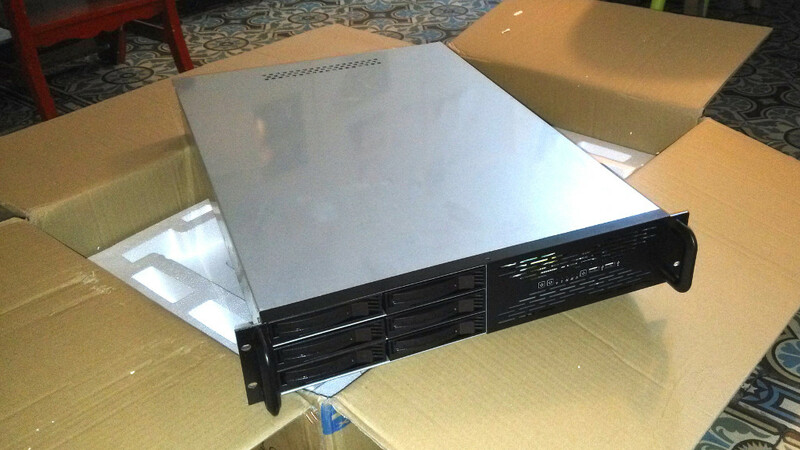 A true steal, the case is very complete and rackmount cases are quite expensive. It's not only deep enough to prevent cable clutter from cooking my stuff. And low enough to keep room in my rack. It also has 6 hot swap hdd bays. Which is easy to help upgrade hard drives. BTW, some of the drives I've been using have been used for over 6 years. I use them more often than most people would. I've used them on faulty sata raid controllers that messed up my data seriously. I've done low-level 0 overwrites, and banged them around physically. They've moved from one case, to the next, to the next... Only one has ever physically crapped out on me, and that was within 2 days of purchase. So if you're getting hotswap bays in case they break down, forget it. If I'm not the type of power user that can wear out drives, you're not. The rails can be adjusted for depth. Unfortunately, even at their shortest, they are too long for the space between my rack posts. So I'll need to remove the sliders, and screw the rails to the insides of my posts. By magical coincidence, they'll fit in the 45.5cm wide space when holding the case. The holes on these particular rails were placed 2.3cm from each end. The holes on the case where placed at the same height from the bottom. 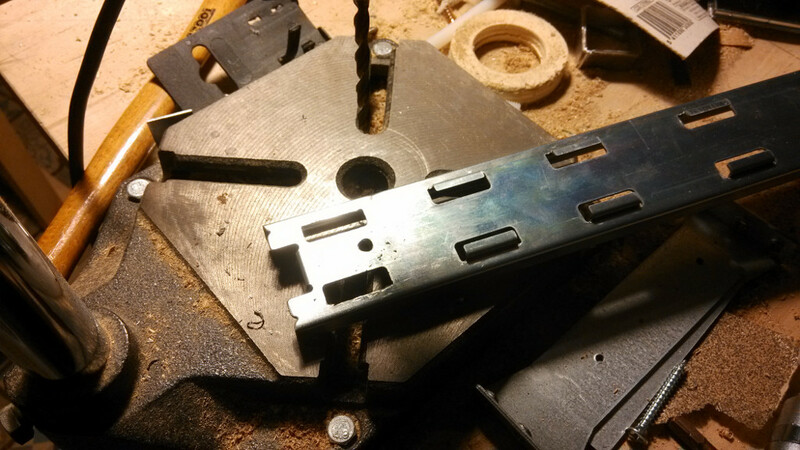 There a lip at the front that allows the rails to be slipped in, though in that placement only one hole can be screwed in and the case can flip over a few degrees. However, this makes it a lot easier to actually attach the case to the rails later on. 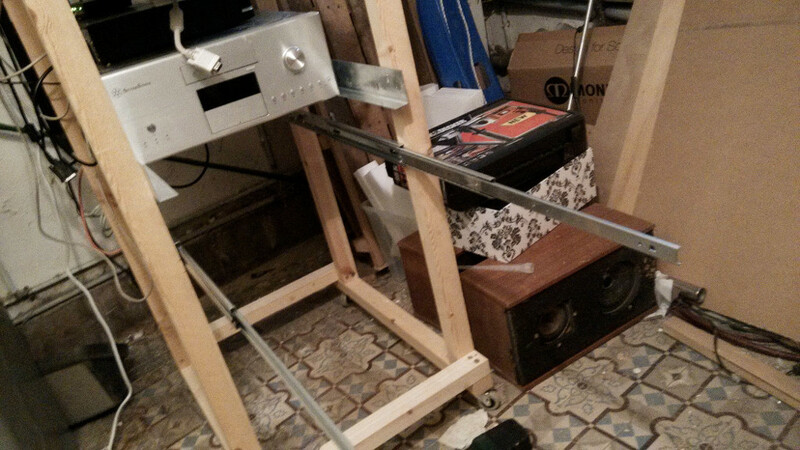 Once the extenders are removed, I needed to cut the lips where the rails would be mounted to the rack posts. 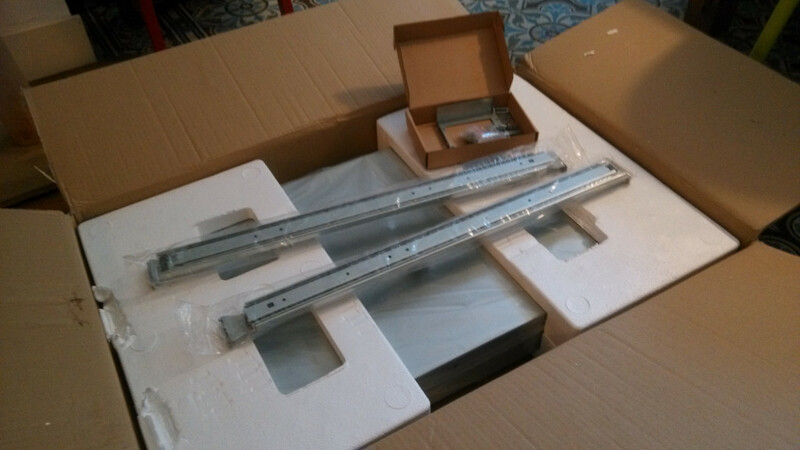 The short extender is secured by 2 screws, so if it ever needs to be put back would still be able to hold the weight. For the long extender the missing lips wouldn't matter unless the rail was extende enourmously. I cut the lips with a dremel, cutting halfway trough and then breakign them off. I didn't feel the need to sand the cut for smoothing. If I cut myself later, I'll rue that. Or not. 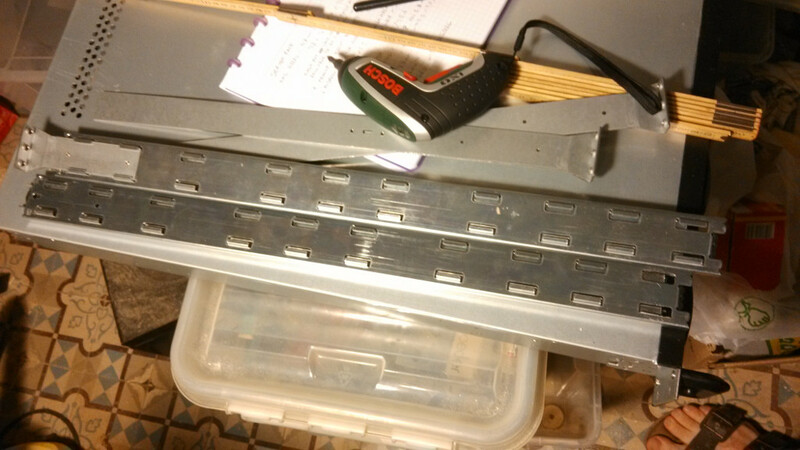 After cutting I also drilled a hole at the back of the rail. The front already has one. Placing the rails was not entirely straightfoward. To get access to the holes, both the old and the new, the rail needs to be moved aside. The rail closest to the outside rail has big square slots to lighten it. So this can stay in place. 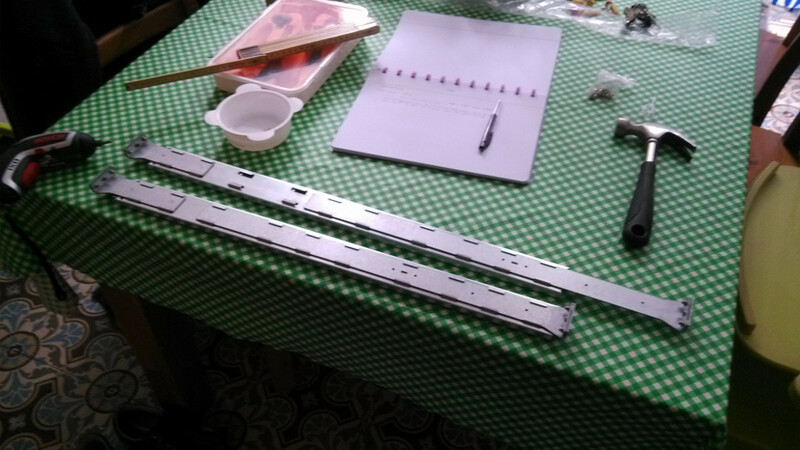 To move the other rails aside, I needed to remove the rubber cover of the metal stop at the back. I then screwed the rail into the front post, and marked and drilled the hole in the back post. I measured the heights off from the bottom of the rack. The case was jammed onto the open rails with the little lip. Then held in position with my knee while I put the screws in the holes. The holes are threaded, but there's no second hole further towards the back. As I said before, this allows the case to flip around the screws somewhat. 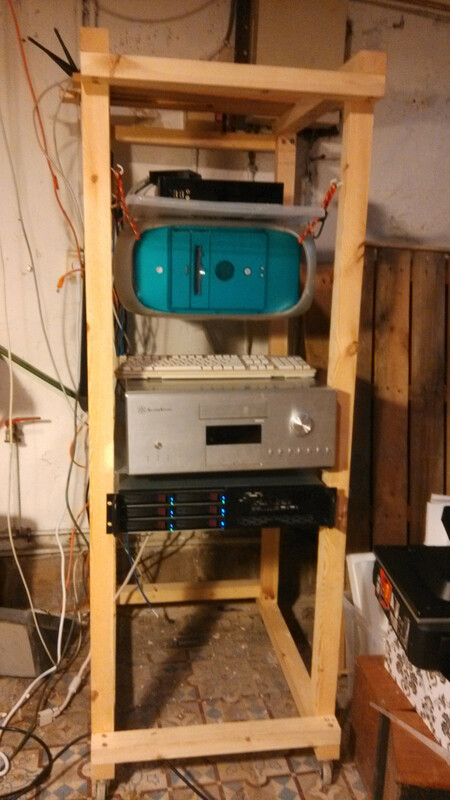 I put the case in the lowest position anything will be in in the rack. Below this will be the air filter system. It's a comfortable height to work on it in a desk chair. There'll likely be a 2u work station above for my monitor and keyboard; again this will be a comfortable height. My 3U Silverstone case above that I can work at comfortably standing. Anything else will need to be taken out of the rack to be worked on. Incidentally I took the front of the Silverstone case and removed a lot of it's innard. It now contains the Gigabyte board that was running my second Unraid server, which has only 3 disks so far. 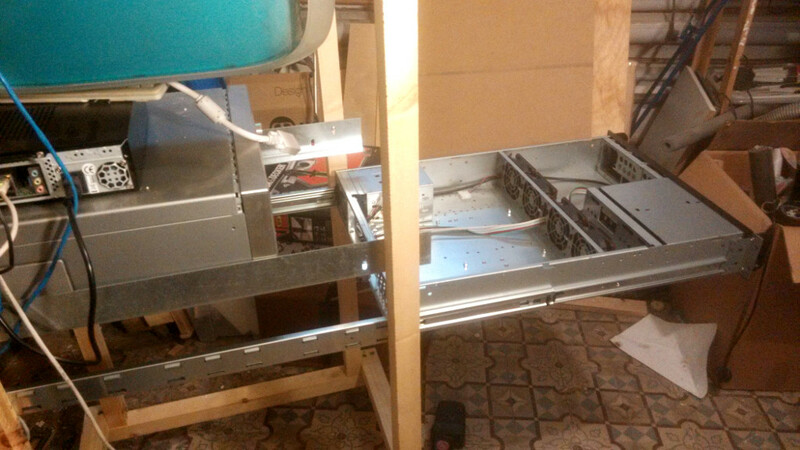 I plan to install a handbuild swap (if not hot swap) method where the entire aluminum front swings up fans and all. The case is nice and clean, however the depth and the placement of the sata connector board pose some problem for the power cables. The board needs 2 molex connectors, which on a modern power supply leaves no cable with a molex connector. The fans have a short molex connector, which doesn't reach the connectors on the cable. 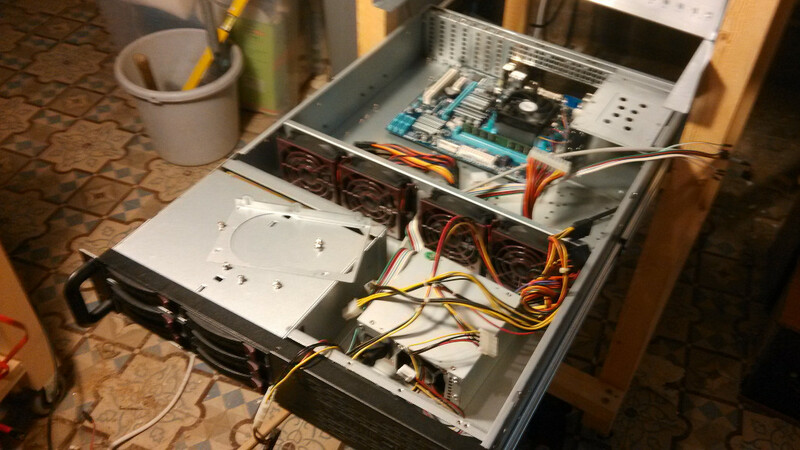 In the end I ripped the molex splitter from the fan at the back, non-hotswap hdd cradle that I don't plan on using. Additionally, I needed an extender for the atx power cables. Unfortunately I had none for the 4pin atx connector. So I had to place the motherboard in the center of the case, rather than at the back panel. In the end for some reason the Gigabyte nic wouldn't work on the Unraid install I needed to use in this case. So I switched it for the original Supermicro Atom motherboard, which has no ATX 4pin connector. This worked out fine, though it lost me a lot of time. Hard drives in their cradles, server booted, disks mounted and blinkenlights happy as can be. The Gigabyte Unraid likewise is properly tucked into the Silverstone- but since the PSU is placed at the left, as if it would be at the bottom, I still need a 4pin extender cable before I can use it. I always thought I'd want a shorter depth case. 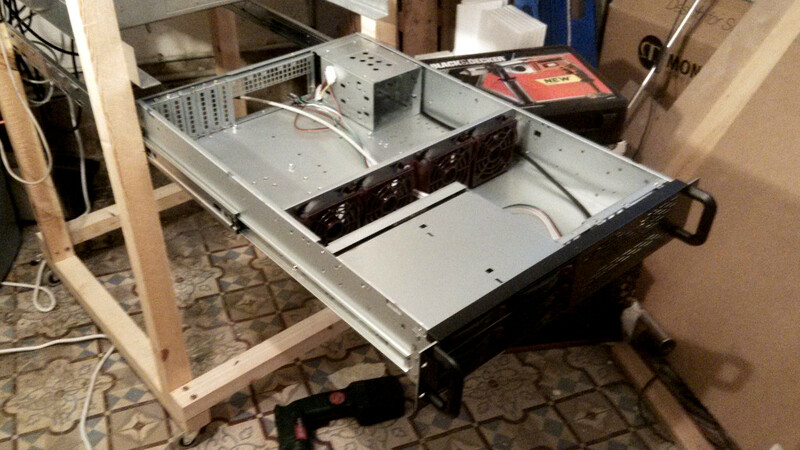 However, the 65cm deep case does not exactly have oodles of space left over unless you have a mini-itx board. uATX is comfortable, but ATX would be too tight. 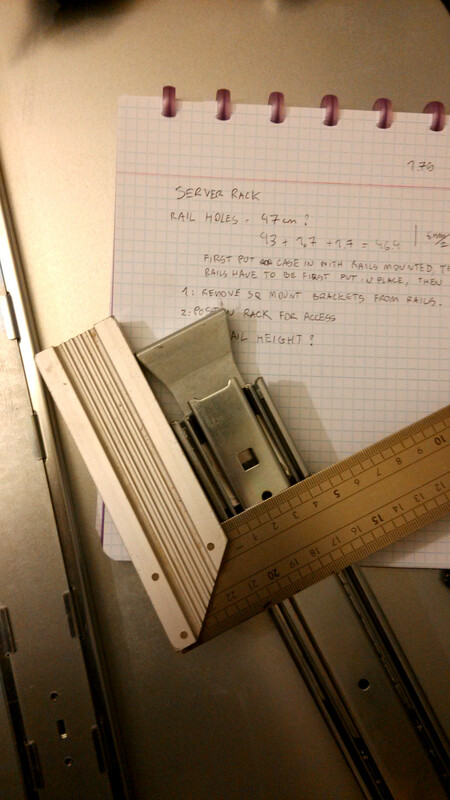 I briefly considered taking the rack apart and setting the posts further apart in depth, so that any future rails could be easily accomodated, too. 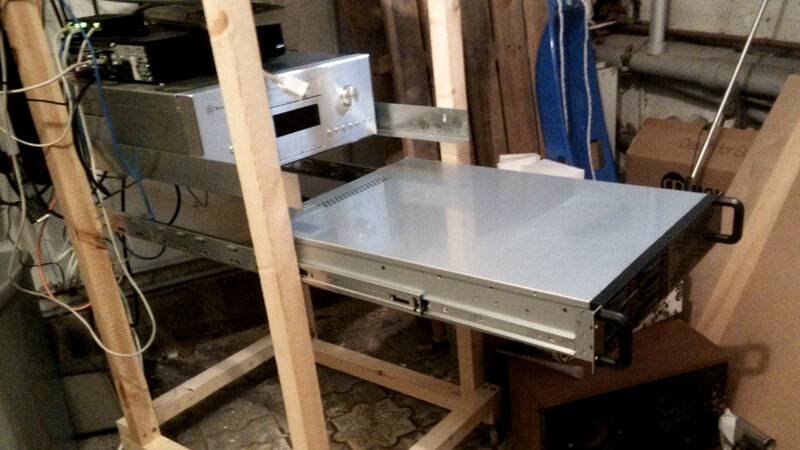 But I wouldn't worry about that too much if you want to construct the rack yourself. Again, as it is the rack allows for the futre addition of a u-profile to be used as rail posts. However, do be careful about the width. Rail kits might assume (mostly) empty space between the posts. 45.5cm is just fine, using the wriggle space inherent in the rail. But it might be a good idea to allow for more space. One issue is that the case sticks out significantly. I'd like to move it back flush with the first post... Ont he other hand I'm still thinking of adding a metal U profiel to serve as rack post. Needs some reflection. The Xcase still needs a better power supply. Ideally a high efficiency silent one. Another thing is that the fan speed on the little fans seems to be a bit over the top. I need to look into the options for Unraid controlling the fan speed based on disk temperatures. I also need to keep an eye on disk temperatures, although they seem to stay below the 50 degrees Google standard temp.